What if Fool Circle was to only make 4 kinds of beer a year starting in 2006. 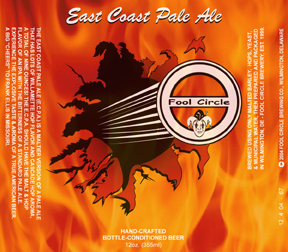 Two parter: 1)What beer styles would you like to see attempted before the end of 2005 & 2)What 4 Fool Circle beers or styles do you think should be the 4 that Fool Circle should focus on for 2006? Suppose said 4 beers start to become brewed on a very regular basis in larger quantity sized batches, so there would “excess” cases of beer available to be acquired through donations, would anyone be interested? And what would be a “fair” price? Fool Circle is currently preparing to go in the following direction: All-grain -> 10 gallon batches -> kegs available. This three tier plan will hopefully be in effect beginning in 2006 and come to completion by the end of 2006. Let me know your thoughts through the contact page. Thanks. B.
P.S. – I brewed a Mild Brown yesterday, should be a good session beer. Competition number two for the year with awards number three and four for the year! Check the results page here. 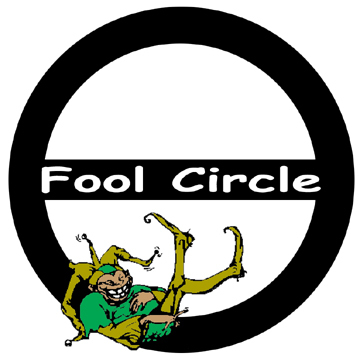 Fool Circle pulled in two awards for one beer with this competition, AGAIN! First I’ll tell you what I entered, and then I’ll let you know what I won. I entered 4 beers in 5 different categories for this competition, this was the War of the Worts X competition, the largest in the area with 286 entries. I entered the Double Dubbel in the Belgian Strong Dark Ale category, the Hunting MacRae in the Old Ale category, the ECPA in the American IPA category and the Hop Devil Clone category, & the ESB in the ESB category. And the winner is . . . The E.C.P.A. II!!! The ECPA won Second Place at the IPA table for being an American IPA and it also won Third Place at the IPA table for being a Hop Devil Clone. That’s great that I won both a 2nd and 3rd Place, but what about the Hop Devil Clone category, what happened to that? Somehow it appears as if both entries became lumped together, and there is no other mention of the Hop Devil Clone category AT ALL on the Keystone website anywhere. You can read more about the ECPA II here at Fool Circle! You can read more about Victory’s Hop Devil here at Victory Brewing Company. The Hunting MacRae (v.05)!!! 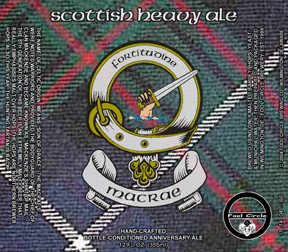 Not only did the MacRae win in the Old Ale category, but the Old Ale category was lumped with several other categories to for a “Big Beers” category consisting of Barley Wines, Old Ales, Imperial IPA’s & Strong Scotch Ale – it was still judged as an Old Ale, but it still had to beat all those others. Also, the Hunting MacRae won the Best B3 Kit Beer Brewer – which was a special category just for this competition. Basically if you brewed your beer using on of the company’s beer kits, Beer, Beer & More Beer (B3), then you indicated that on the entry form. I don’t know if they took just the highest scored number or had a seperate judging, but SWEET! Also, since it was first in one category, it had to of been in the Best of Show judging though it obviously didn’t win. I really couldn’t be happier. There were 98 entries from all over the country, probably mostly California because that is where the store is located. I was a little hesitant because after entry fees (typical) and shipping (3 day from Delaware to California, not typical) the price to enter this competition was higher than I normally paid – but I went for it, and it was worth it. Plus now I’ll get reviews on 4 of my beers before two of the competitions out here which may help me decide if I should enter them in a different category. Just FYI, posted on the B3 site was this snipet, “The best B3 Kit Beer will get two free kits and yeast of their choice, plus a B3 shirt or hat. And the ribbon. First place winners of each category will get something special too, along with the ribbon.” Sweet, they know how to play up to us! The Village Idiot – “BIF” edition is now available for your bathroom reading material pleasure. Check it out here at the Village Idiot archives if you haven’t recieved it already. If you like what you read, feel free to sign-up for the next newsletter at the top of that page. Enjoy & may Beer Karma surround you! What should one do before the Super Bowl? Well, I made beer – sounded like it fit the day to me! 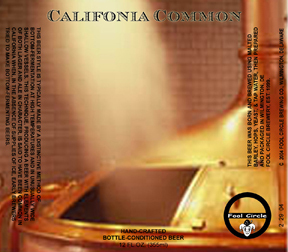 So, partially because of demand and partially because I damn well felt like it, I brewed the return of the Califonia Common. Yes, you read that right, the Califonia. So far everything seems great, brew day went off with out any major problems, and the beer was fermenting in less than 8 hours. Hopefully it’ll be ready in time for the 22nd Hops Bops in March, go for a repeat for Best of Show – why not! You are currently browsing the Fool Circle – Artisanal Ales blog archives for February, 2005.